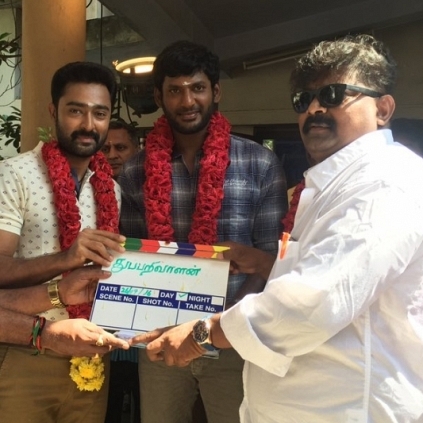 Vishal’s home banner Vishal Film Factory had commenced his next production venture Thupparivaalan today (26th September) to be directed by Mysskin. The film will feature Vishal, Prasanna in the lead with K Bhagyaraj and Vinay in pivotal roles. Rakul Preet Singh will be the heroine. Vishal took to his official Twitter handle to share, “Startd my nxt home prod @VffVishal #Thupparivalan wit #mysskin sir wit @Prasanna_actor @ArrolCorelli.gna b an xciting one.need ya wishes.GB”. This is the first time that Vishal would be working under director Mysskin and the combination has evoked a buzz in the industry. People looking for online information on Actor Vishal, Mysskin, Thupparivaalan will find this news story useful.